Ambassador Balázs Csuday was Hungary’s Permanent Representative to the United Nations and other International Organizations in Vienna from 2010 to 2014. In June 2015, he joined Price WaterHouse Coopers (PWC) Hungary as Director of Government Relations. On behalf of the Hungarian Minister of Foreign Affairs, he was serving as the Article XIV coordinator of the Comprehensive Test Ban Treaty. He was also negotiating the Outcome Document of the International Ministerial Conference on Nuclear Security held in Vienna in 2013 under the auspices of the International Atomic Energy Agency. From 2011 he was the Hungarian Sherpa of the Nuclear Security Summit. In 2009, he served as Counsellor, Seconded National Expert, with the Delegation of the European Commission to the International Organizations in Vienna. Prior to this, he was the First Secretary at the Permanent Mission of Hungary to the United Nations in New York from 2004 to 2009. Earlier positions held within the Hungarian Ministry of Foreign Affairs included Legal Adviser with the Department on European Union Co-operation in Justice and Home Affairs from 2002 to 2004 and Special Assistant and Legal Adviser to the Under Secretary of State responsible for South Eastern Europe, post-Soviet region, Central Europe and Consular Affairs from 2000 to 2002. Prior to this he served as Legal Adviser to the Department on Strategic Planning and Affairs. 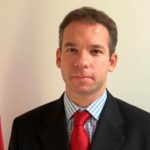 Before joining the Ministry of Foreign Affairs in 1998, Csuday was a paralegal with the Law Office of Réti and Antall/Stikeman, Elliot from 1996 to 1997 and an Advisor at the Democracy after Communism Foundation from 1995 to 1996.